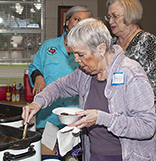 Hot bowls of spicy gumbo were on the menu at the open house for the three west of the Brazos Chambers of Commerce - Brazoria, Sweeny and West Columbia and their supporters on Thursday, February 21. Folks gathered at the FOR Community Center to celebrate their ties to the San Bernard with delicious gumbo and good conversation. On the left are the open house gumbo chefs Fred Kanter and FOR past president Nancy Kanter. Standing next to Nancy is Sweeny Chamber Executive Director Kim Jurek, West Columbia Chamber Executive Director Callie Venable, Brazoria Chamber Executive Director Dede Truitt, FOR VP Suzanne Goodson and FOR President Wayne Head. 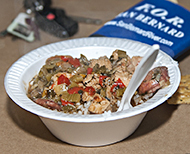 An attendee at the open house helps herself to a bowl of the delicious seafood concoction.